“WHERE WILL MY HELP COME FROM?” | The Lion of Judah Academy – Important Stuff! This is what corn looks like in drought conditions! This is the third of three posts about the current drought and food crisis effecting The Lion of Judah Academy. The first was about typical food served in the school dining room. The second dealt with the severity of the crisis. Tanzania and East Africa are currently experiencing a period of great crisis and drought. At The Lion of Judah Academy the students and staff know, very well, that their help comes from the Lord. Their “daily bread” comes from the hand of God. And rain, when it comes, will be God’s gift to break this drought. But they – and we – also know that God expects us to look to Him for wisdom regarding how to deal with problems once they come to us…and when that wisdom is given, God expects us to act on it. We believe God has given us some important actions to take to deal with the devastating effects of the drought conditions which occur all to often in East Africa. Hopefully this drought will end with the fall rainy season. But whether it does or doesn’t, we believe God is showing us how to better cope with these times of crisis. There are, we believe, three primary areas where God has challenged us to make improvements. THE GARDEN — Having a school garden has long been a vision…and started to become a reality about 15 months ago. When our mission team visited the school last July (July 2011) we ate cabbage, tomatoes, watermelon and other produce grown in the school garden (see the photo album at the end of this post). It continues to develop, becoming larger and more productive. But in reality, the garden started long before that. Slowly, acre by acre, God has provided – and is still providing – land near the Lake, with each piece adjacent to the next. We needed two large well-like pits for the water system which would eventually be located there…but there seemed no reason to build them before we had electricity. Until we realized that those pits would provide perfect ways to draw water by hand for limited irrigation. Slowly our gardeners have been learning, sometimes by trial and error, how to properly plant, cultivate, and grow (who knew there are male and female papaya trees…and the fruit won’t grow if you only plant male trees?). We will need to grow a huge amount of food in order to feed 350+ students on a daily basis. But God is laying a groundwork for a large, productive garden which can be a tremendous help in times of drought and famine. IRRIGATION – When Lynn and Hart first arrived in Tanzania back in 1999, we were struck by the fact that we lived on the shore of one of the largest lakes in the world – Lake Victoria. Yet within fifty yards of the Lake crops were failing because there was no way to water them! “Why is there no irrigation?” we lamented. Well, we learned there were several reasons for that. But one of the biggest was…and is…money. Money to purchase the expensive pumps…even small ones. Money to install and maintain irrigation systems. And, perhaps biggest of all, money to pay for the fuel to run the pumps which pump the water. Diesel, the most common fuel for pumps in Tanzania, costs over $6.00 a gallon! At prices like that it’s much cheaper to buy the food than the fuel to operate the pump! But electricity? Well…if you could get electricity down to the pumping area…electricity is much less expensive to buy and much more efficient to use. But there was no power running down that direction at all. And THAT is one of the biggest reasons we have, all along, been working hard to raise funds to run electricity down to the pumping area for the new Lion of Judah Academy water system! We absolutely need water at the school for the students and the staff…and if that were the only reason to have it, we’d still have made the water system a top priority. But we have also, from the beginning, believed that if we did it right, we would be able to use that water to provide inexpensive…and life-giving…irrigation to the school gardens which didn’t even exist, except as God’s promise! Often we have been close to giving up, thinking we would never achieve the goal of getting electricity down there. But we knew that was God’s plan. And now…the electricity will be installed very soon…we’ve already been to the electric company to pay for it! And not long after the electricity will come the water storage tank, the installation of the pump…and the water!! To the school campus…and to the garden! MORE EFFECTIVE AGRICULTURAL TECHNIQUES – The Inlows and the Mtebes have many skills and abilities. Agriculture is NOT among them! 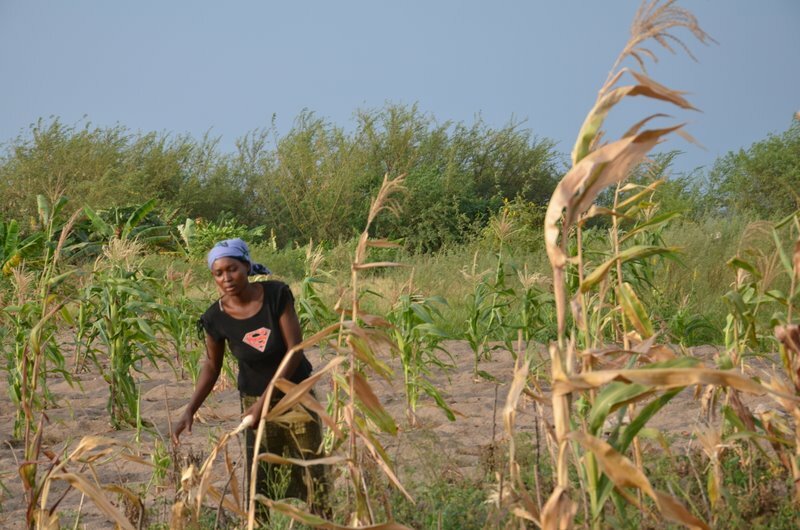 Our Tanzanian board of trustees are talented and capable men and women…but they are NOT farmers! At first glance, that might seem like a liability, if you need to develop a school garden. However, our God has this amazing way of transforming liabilities into assets. And one of the principles which has set The Lion of Judah Academy apart from the beginning is that we are willing to do new things in new ways, following God’s leading. Traditional farming in Tanzania is hard…and truthfully, it’s not terribly effective. But it is the only way they know. For years God has been prodding us to think about other ways…better ways…to do agriculture. But we’ve been severely hampered – we’re not farmers! More recently God has been introducing us, slowly at first, and now with increasing speed, to resources for farming in East Africa which, we believe, may hold great promise for the school gardens. One of those is ECHO – “Educational Concerns for Hunger Organization” – located just a couple of hours from the Inlows new home, over in Ft. Myers, Florida. It “just so happens” that two old and dear retired friends volunteer there. They invited us to come take a tour last January…and our eyes were opened to amazing new possibilities, as well as many ideas about how those possibilities might be implemented at The Lion of Judah Academy! We next discovered that a former ECHO intern is now living less than an hour from The Lion of Judah Academy! And, just last weekend, we had missionary friends, who are currently living at ECHO as “missionaries in residence.” We spent hours and hours talking about agriculture in Tanzania! This sounds suspiciously like one of those “God things”! Then there is “Farming God’s Way,” another amazing resource God has introduced to us. Farming God’s Way is a field tested and proven approach to more effective agriculture methods in arid regions of Africa, and comes with a wealth of training materials and practical, hands-on help. We have spoken extensively to missionaries who are implementing the approach in their areas, with amazing results. Then, suddenly…almost miraculously…things come together! Food starts growing in the garden. The electricity is installed…so the pump and the water system can be completed. And resources for how to more effectively farm in the African setting unexpectedly begin falling into our laps! What a great God we have! And He is doing it all in the midst of such a crisis and drought. What glorious things God has done…and continues to do! “I lift up my eyes to the hills. Where will my help come from? Finally, here’s a link to a few photo albums of the school. Select the album “Water Project at The Lion of Judah Academy” to see several photos of the water project, the garden, and related things of interest. This entry was posted in Faith, History, Miscellaneous, Prayer and tagged agriculture, drought, famine, food, Lion of Judah Academy, rain, Tanzania, water. Bookmark the permalink.